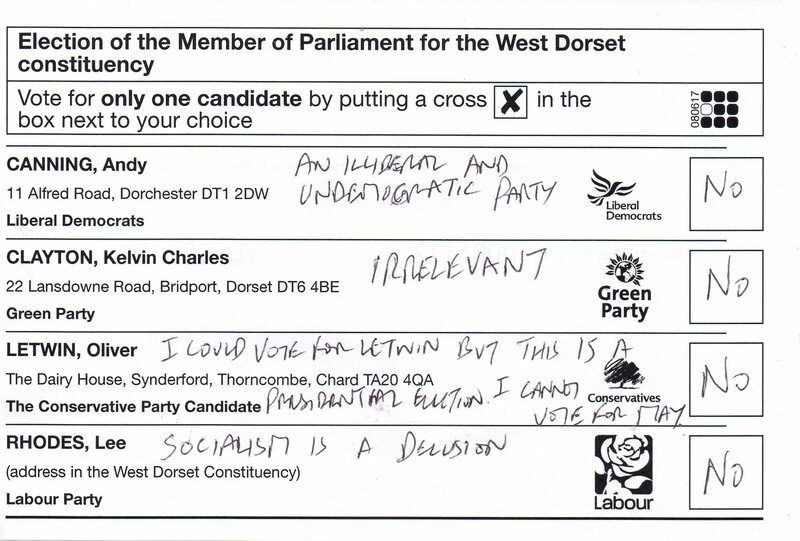 My Spoiled Ballot Paper. What Other Choice Is There? I remain a member of the Conservative Party but Theresa May is not a true Tory. It is she who has made this a presidential election, against all the principles of British democracy and I cannot possibly support her. She betrays all fundamental Tory values. She doesn’t believe in individual liberty and responsibility, she is a repressive, nanny-state authoritarian. She doesn’t believe in small government, she is a bureaucrat who wants an ever-larger state encroaching into every aspect of our lives. She is not a true Tory. Please review my previous articles about Mrs May. 22-01-17 – Theresa May Is Not A Tory, She’s An Authoritarian Bureaucrat. 29-03-17 – Thank You Ms May, Your Work is Now Done. 07-05-17 – Theresa May Isn’t Strong, She’s Cowardly, Evasive And Weak – And I’m A Tory! 22-05-17 – The Best Election Outcome Is A Tory Government With A Weakened Theresa May. « A Significant Day For Cannabis Law Reform In The UK.